The phrase catches me by surprise, but it captures in the most concise way exactly what the prisoner sitting across the table has done, in style, with great courage: he’s confronted structured force head-on. Julian Assange could be described as the Tom Paine of the early 21st century. Drawing strength from distress, disgusted by the hypocrisy of governments, willing to take on the mighty, he’s reminded the world of a universal political truth: arbitrary power thrives on secrets. We run through how WikiLeaks perfected the art of publicly challenging secretive state power. This “intelligence agency of the people” (as Assange calls his organisation) did more than harness to the full the defining features of the unfinished communications revolution of our time: the easy-access multi-media integration and low-cost copying of information that is then instantly whizzed around the world through digital networks. WikiLeaks did something much gutsier. It took on the mightiest power on earth. It managed to master the clever arts of “cryptographic anonymity”, military-grade encryption designed to protect both its sources and itself as a global publisher. For the first time, on a global scale, WikiLeaks created a custom-made mailbox that enabled disgruntled muckrakers within any organisation to deposit and store classified data in a camouflaged cloud of servers. 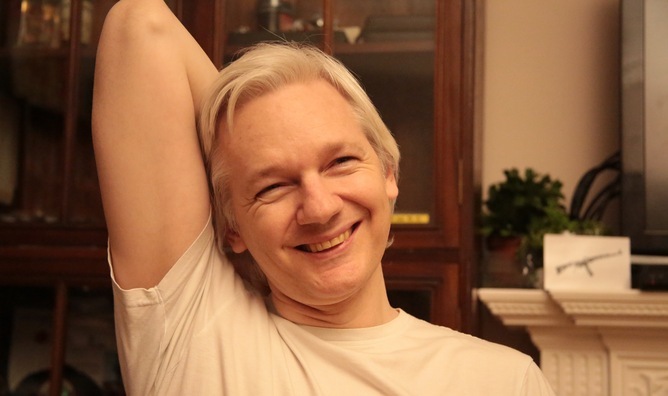 Assange and his supporters then pushed that bullet-proofed information (video footage of an American helicopter gunship crew cursing and firing on unarmed civilians and journalists, for instance) into public circulation, as an act of radical transparency and “truth”. Assange agrees the WikiLeaks Party must address and respond creatively to the creeping local disaffection with mainstream politicians, parties and parliaments. “I loathe the reactiveness of the Left,” and that’s why, he says, much can be learned from clever new initiatives in other countries. We discuss Beppe Grillo’s 5 Star movement (it could well win up to 15% of the popular vote in Italy’s forthcoming general election). On our list is the Pirate Party in Germany (it practises “liquid democracy” and has representatives in four state parliaments). So is Iceland’s Best Party. It won enough votes to co-run the Reykjavik City Council, partly on the promise that it would not honour any of its promises, that since all other political parties are secretly corrupt it would be openly corrupt. Assange lets out a laugh. “Parties should be fun. They should put the word party back into politics.” The WikiLeaks Party will try to do this, and to learn from initiatives in other democracies. Supported by networks of “friends of WikiLeaks”, it will be seen as “work in progress” designed “to outflank its opponents”.